With fall in full swing, the makers of the LA VICTORIA® Brand, known for authentic, flavorful salsa, enchilada sauce and taco sauce, are offering five seasonal recipe ideas that put a unique spin on your favorite comfort foods. Whether preparing a Friendsgiving dinner or offering up a tasty side for game day, salsa provides an unexpected way to spice up your next seasonal gathering. Blistered Brussels and Cauliflower—Topped with a blend of olive oil, lemon juice, almonds and salsa verde, this is a healthy and flavorful addition to any fall menu. Butternut Squash, Black Bean, and Green Chile Enchiladas—Nothing says fall quite like butternut squash. For a unique and vegetarian spin on a classic, try this savory, intensely flavored dish. Salsa Baked Mac ‘N Cheese—This is comfort food at its finest. With a Mexican twist and hint of heat, this is an easy weeknight side dish or delicious contribution to a holiday gathering. 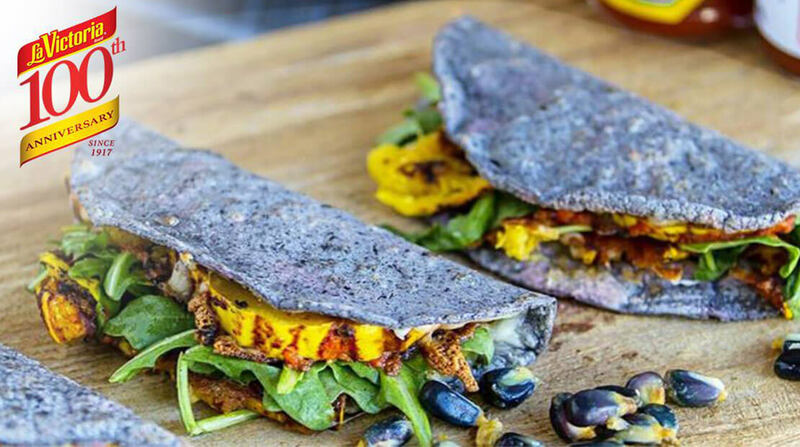 Wood Grilled Adobo Squash Taco—Squash is plentiful this time of year, so get creative on taco night with a vegetarian delight. Guajillo and ancho chiles blend together for a savory adobo sauce that completes these tacos. This year, the makers of the LA VICTORIA® Brand are celebrating a delicious culinary tradition: the 100th anniversary of salsa as we know it in America. As the pioneer of jarred salsa in the U.S., the makers of the LA VICTORIA®Brand have kept the Mexican tradition alive and well in the hearts and bellies of today’s consumers for a century while using field-to-jar tomatoes in its salsas. For more recipes and information about LA VICTORIA® foods, please visit www.lavictoria.com or contact the brand at LaVictoria@havasformula.com. Established in 1917 on the West Coast of California, the makers of the LA VICTORIA® Brand were the first to make jarred salsa and an original maker of Mexican sauces. LA VICTORIA® brand products include salsa, taco sauce, enchilada sauce, chiles, peppers and fruit-flavored salsas. The line is known for its bold, robust flavors and is easily identifiable in the grocery aisle by its iconic jars. The LA VICTORIA® brand operates under MegaMex Foods LLC, a maker of a comprehensive portfolio of products that resonate with Mexican-American and mainstream consumers of Mexican foods. For more information about the LA VICTORIA® brand visit www.lavictoria.com or follow LA VICTORIA® brand on Facebook, Instagram and Twitter @LaVictoriaBrand.